Is it the same pattern? 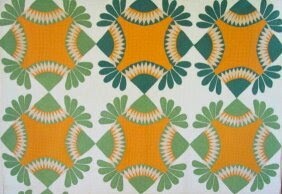 A few days ago, I posted this photo of a quilt I would like to make. I was looking for the name of the pattern. Karen commented that it was “Grandmother’s Engagement Ring.” She was able to find it in Barbara Brackman’s quilt block encyclopedia. Last night I was doing some walking on the treadmill (I know, shocking!) and flipping through some old quilt magazines. 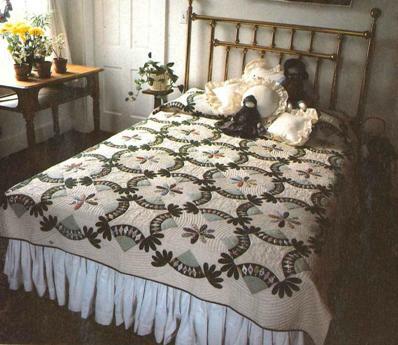 I came upon this photo from Lady’s Circle Patchwork Quilts, May 1986 page 13. The quilt was one of the Mountain Mist contest winners, and was the winner of the Grand Prize at Houston Quilt Festival in November of 1985. The pattern is Mountain Mist pattern #109. Isn’t it amazing how two people can take the same pattern and give it a totally different look? I don’t think these look anything alike, and yet they are both stunning! Do you hang on to your old quilt magazines? I have them dating back to the mid 1970’s. I’ve tossed a few and sold a few more, but still have a lot. 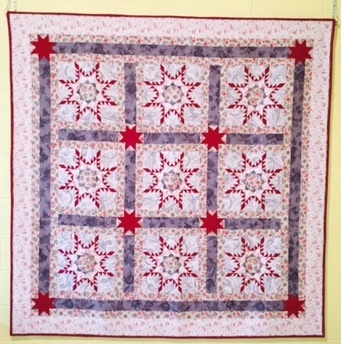 It is fun to look back and see the changes quilting has taken through the years. We put a lot more quilting on our quilts now, and they have a totally different look. Makes you wonder what they will look like twenty years from now, doesn’t it? Check out this page for another photo of this same quilt! I just found it — and other Mountain Mist quilts – online! I checked out the quilt you found in the magazine. Very pretty! Different from the first one pictured but I think mainly due to color selection. I don't keep my old magazines very long. A storage problem. I do take out things that interest me and save those for a while. I think that's what I've always loved best about quilting is that no two (same) patterns ever look alike because they are based on personal choices. All are unique and so so awesome!! !